Not that they need the cases split, but cams and clutch should be done. Maybe a displacement and compression increase. Do you suspect your “issue” has had an affect on the primary, charging system and transmission? Or might it be limited to the top end? So what requires attention? crank or transmission, apart from the cranks in the 04 and 05 bikes the bottom end of the rubber mounts have proved to be almost bullet proof, unless you have used a mls gasket and pulled a cylinder stud? I have a 2013 on the bench this week and will be splitting the cases to install the Buell XB/XR1200 crank, have done it several times, nice and straight forward job, use the drain plug to get the oil out before you split the cases, saves a lot of mess. The stator threads for top screw are knackered and I buggered up a thread repair. Bike has 35,000 miles. This is my fourth stator, first three replaced under warranty. I went aftermarket this time, and will be using non-torx screws. 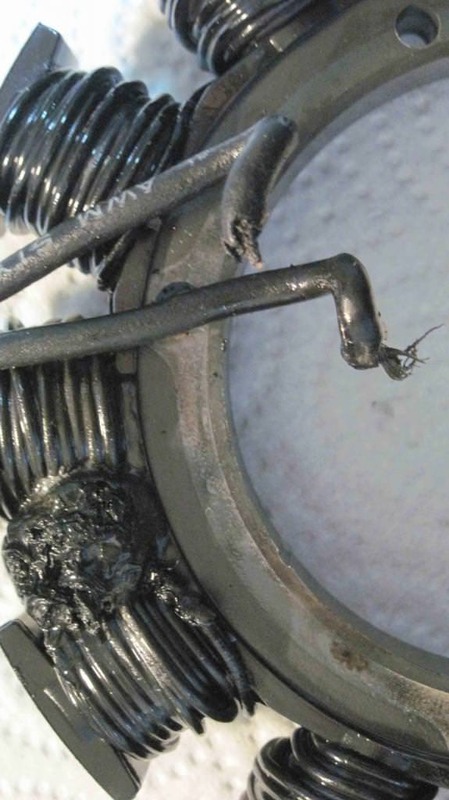 The first stator died at 16,000 miles. Second at approximately 28,000 miles. This one died at 35,000 miles. Harley tested the charging system and stated everything else was fine. The stators all fail in the same location, either one or both poles nearest the leads. I knew what it was the moment I saw the battery light. The smell of the fluid in my primary when I dumped it confirmed the problem. I will be replacing the regulator with a MOSFET type, the battery, and going through all the wiring and connectors. I had a low side a couple of months ago and since I am doing some other work, I figured I would get it all done now. I also had a wheel bearing failure at 34,000 miles, a clutch failure at 24,000 miles, and a crossover pipe crack discovered when the first stator failed all covered under warranty. I hope Harley is sending a disclaimer to their international customers before they drink the Kool Aid. When they covered my rear wheel bearing failure, I noted the country of origin for the replacement wheel was China. While I believe the Chinese make excellent equipment, I think the "wanna be hard" types might have a heart attack were they aware of this..
Back in the 70's, a lot of motorcycle Owner's manuals had a section on Safe Operation and it would say "on extended riding, to stop after an hour or so and let the motor cool for 20min. to a half hour before continuing on. This caution is no longer in the newer manuals. It may apply to Ironheads but I don't think it applies to Evo Sportsters. Still, on a long road trip and temps above 80F, I always stop after an hour or so to let mine cool (in shade if possible) it also keeps me from getting too exhausted. Wow, HD have definitely let you down with those stator failures, there is clearly something else wrong to have repeated stators fail, I would contact HD direct and ask for their assistance, that is not right. I would also be telling HD about the knob who said "Sportsters were not meant to be ridden for long periods of time on the freeway" what a moron, you will come across members here who have ridden their Sportsters over a couple of hundred thousand miles. Contact HD, they can only say no. well, that stator failure goes wayyyyy back. my 01 failed the same and about 15k miles also. it is not the stator that fails but the connection from the winding to the pigtail to the regulator. the issue is hd just glues the connection to the stator, glue breaks down and oil enters the connection and small currents will pass to ground and eventually the electrolysis destroys the connection.